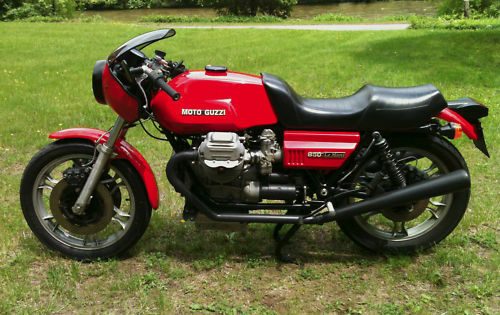 I’ve always been a fan of big Moto Guzzis: the thudding exhaust note and the long, low styling, the motor’s huge, finned cylinder heads sticking out into the wind. 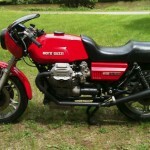 While we’re on the subject of those glorious jugs: please note that Guzzi’s have a longitudinally mounted v-twin, in spite of the fact that so many major online and print publications refer to them as “transverse.” The crankshaft is oriented along the bike’s main axis, just like a big Chevy V8 or a BMW straight six. 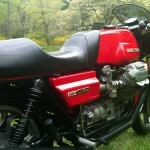 A transverse v-twin would have its crankshaft running across the frame. Like in a Honda four cylinder automobile. 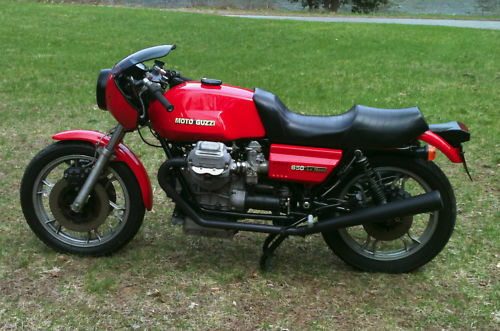 Current Guzzis are both modern and retro at the same time and one of the best sounding bikes I’ve ever heard was a Sport 1100i, but the one I’ve really wanted, ever since I ran into one up on Mulholland Highway in California, was the LeMans Mark I. In point of fact that first one I met was actually a “Mock I”, but more on that later. 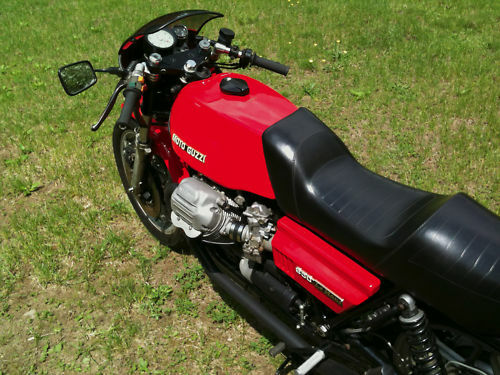 It’s father was among the first of the superbike breed from the early 1970’s, marrying the big v-twin of the touring-oriented V700 to an all-new, low and lean frame designed by Lino Tonti. 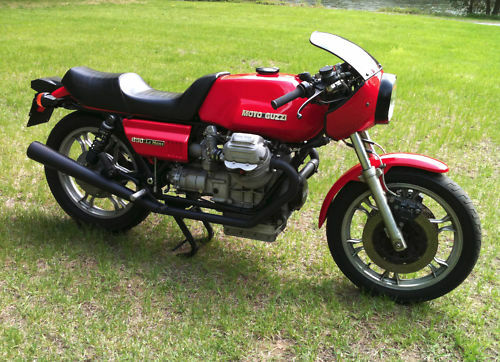 1976, to keep pace with the superbike wars then taking place between the major manufacturers, Moto Guzzi introduced the LeMans, with a bump from 750 to 850cc’s. 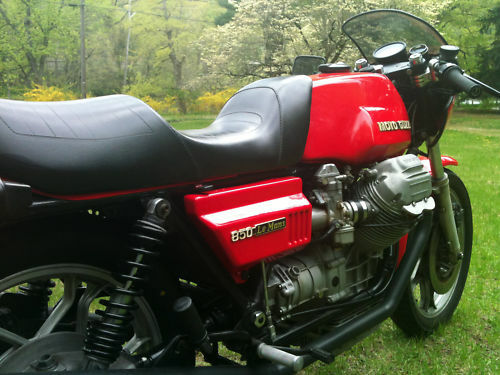 Chrome-lined cylinders and high-compression pistons set it apart from its more pedestrian stable-mates from Guzzi. 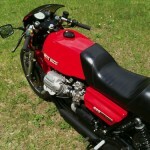 The bike made 71hp at the wheel, giving it a top speed of about 130. Those numbers don’t sound like much today and didn’t exactly set the world on fire in 1976. But the bike offers real world drivability and performance that’s hard to match in a vintage machine, coupled with brutal good looks that earned it a spot in the Guggenheim’s “Art of the Motorcycle” exhibit. This one from eBay looks like a real peach. 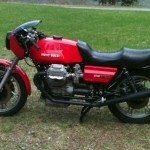 Redone in 1999 as a vintage racing prototype at Raceco US, Brooklyn, New York by the famed race tuner and legendary Moto Guzzi guru Manfred Hecht. Genuine Raceco Le Mans with many special features set up brilliantly. In street trim with working lights, 2 up seating. 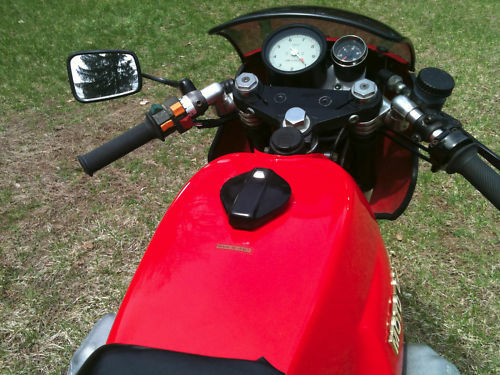 Speedometer delete. Tach and oil pressure guage only, hi beam and alternator warning lights as well. Runs and rides fantastic, has low miles -only 2.5 tire sets- approx 5k. Never raced on the track, just the backroads! Rare Opportunity. • Desirable Agostini timing gears to replace the unreliable timing chain that eventually stretches, causing irregular timing. • Carillo rods and bigger Gilardoni pistons. • Stepped seat to replace the angular, one piece molded-foam seat that tended to fall apart quickly. Hard to tell if this is the original paint: the LM1 had an orange “safety stripe” on the fairing that’s not visible in the photos. Speaking of: this bike appears to have the American headlamp: note the black housing that projects slightly out of the fairing. European versions were almost flush-mounted. I’ve seen several in the US that sport the cleaner, European unit. There’s also no mention of the linked brakes that came on the LeMans. Originally, the hand lever operated only one of the front calipers. The foot pedal worked the other front caliper along with the rear, separated by a proportioning valve that kept the rear from locking. 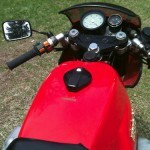 By all accounts, the system worked very well, but some sport-minded riders change this to a more conventional set-up. It’s always important to do your homework with these: many of the later, less desirable LeMans have been converted to look like the Mark I and are sometimes referred to as “Mock I” bikes. A few years back when I was looking at these, the prices for good, original Mark I bikes were hovering around the $5,500.00 mark but have steadily moved upwards. Pricing is now at $7,500.00, with the “reserve not yet met”, which seems to be at the bottom end of the range for these bikes currently. Not sure what the seller has set as a reserve price, given the work that’s gone into this bike, but it’s a gorgeous, rideable machine. Why oh why do so many modifiers assume their personal tastes dictate fashion? or that they can improve on the original design? That seat is an abomination, IMHO; it’s rounded shape is a stylistic contradition of the sharper lines of the rest of the bike. 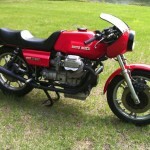 No, this bike does NOT have the original paint – if you remember, the LM’s tank was actually black with two red (or blue, or white) panels on the sides – it looked red, but in fact the top, front, back and underside was black. In fact, I wonder if this bike wasn’t an accident victim earlier in its life? Why else the non-standard forks, footpegs, switchgear, no fuel filler cap, high-crossover exhaust, after-market handlebars, lack of a starter & kill switch and sidestand, and peculiar instrumentation? And where are the front turn signals? Over-boring was often done when pistons and bores wore out prematurely, thanks to the lack of air-cleaners – not from a need for more power. The fluoro panel was a sticker – and it faded really fast. Amazingly, the factory kept trying with fade-fast fluoro stickers right through to the LM 3. As to the “reliable” Agostini timing gears – well, I’ve got a set that weren’t hardened properly and the keyway on the crank became enlarged enough to allow pistons and valves to meet. Thanks, but I’ll simply replace that ‘unreliable’ old chain every 80,000km or so!